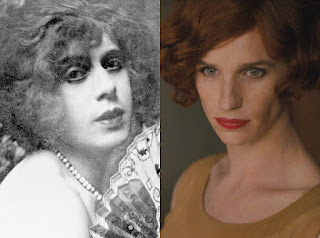 Eddie Redmayne has once again given one of the most powerful performances of the year as Lili Elbe, who received the first transgender operation surgery in 1930. Sadly "The Danish Girl" hasn't gotten as much recognition as I thought it should have, especially seeing how important the film is, and that it was made at such an appropriate time. It's hard to fathom the thousands of people like Lili who grew up during a time when they couldn't talk about this. It's even more difficult to fathom the thousands of people struggling and alone today. We meet Lili as Einar Wegener in 1920s Copenhagen. He and his wife Gerda, played with such beauty by Alicia Vikander, are both artists and big in the social scene. When Gerda's female model fails to show, she asks her husband to be a stand-in. As he holds the ball gown and delicate heels, we immediately see how it prompts muffled emotions from his past. What turns into a silly game soon becomes a struggle for the married couple. The music is wonderful. It's a soaring theme. The landscape is beautiful. The film is classic Tom Hooper - jumping right to the point, but full of quiet, touching moments, much in the style of "The King's Speech". It's full of emotion, and Eddie and Alicia's work is truly beautiful. It's a wonderful message, and heartbreaking at the same time.